So I love iced tea. It’s my favorite drink ever. My love for iced tea came from my Mom, who used to brew sun tea on our front walkway years ago when I was a kid. I remember she’d put the tea bags into the large pitcher, adorned with sunflowers, and would set it out in the sun to brew. Then she’d sweeten the amber-colored liquid with lots of sugar and I just gulped it down. When I remember this, I remember she always used Lipton Iced Tea. Never anything else – always and only Lipton. What can I say? My Mom has good taste. And since I grew up guzzling Lipton tea, I only use Lipton when I make iced tea at home now. Whether it’s sweet, peach, green, spiced with cinnamon sticks or regular black tea, I just love the stuff. But sometimes I like to reimagine my tea, just like I enjoy reimagining classic desserts with fun twists. 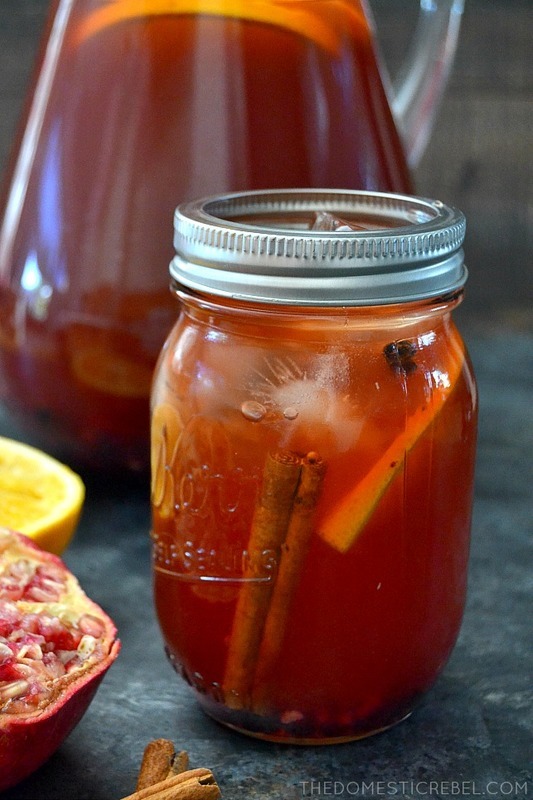 And this Spiced Pomegranate Orange Iced Tea is no exception! Since fall is officially here, I am all about fall flavors. I was thinking about reimagining this iced tea recipe, I wanted to include cinnamon sticks and oranges, which always invoke a comforting feeling I enjoy. But I wanted to also add a little something else, which is why I chose pomegranate juice to zip it up. 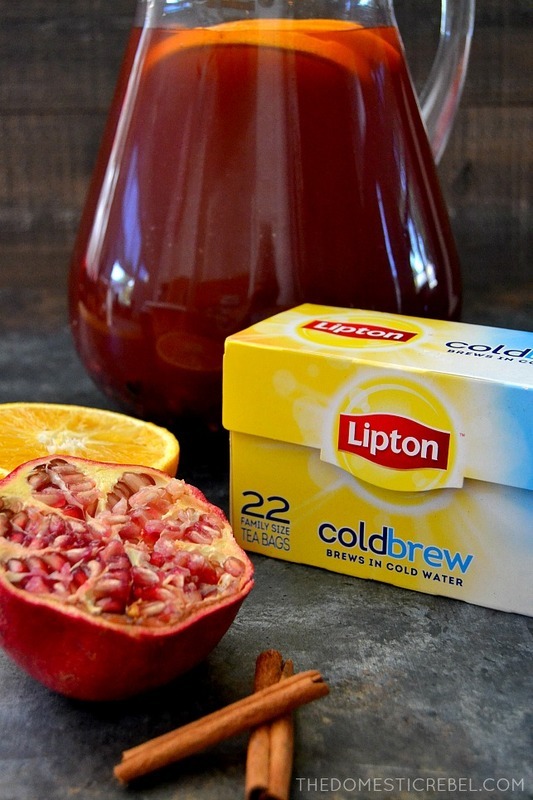 The pomegranate adds a nice tartness to the tea and it tastes so fabulous with the spiced orange flavors. 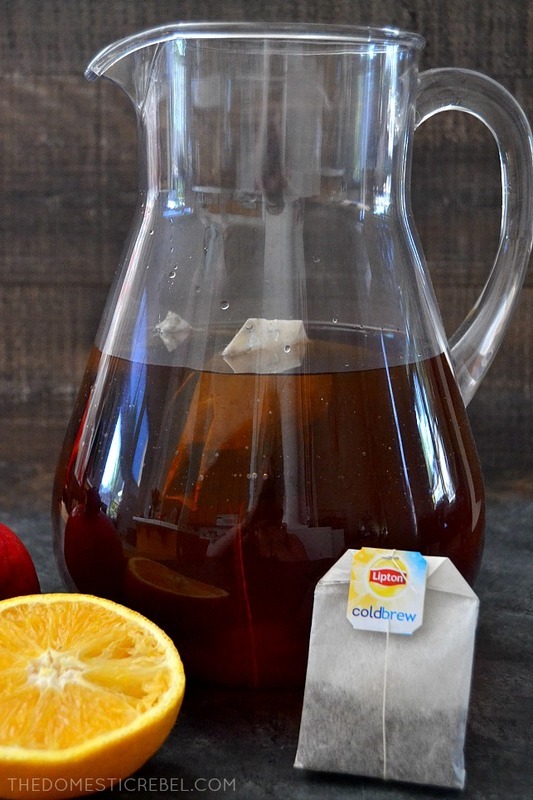 Together, the combination of zesty oranges, bright pomegranate and comforting cinnamon with Lipton’s black tea is officially my new favorite. It’s sweet, spicy and vibrant, but still has that classic iced tea flavor I’ve loved ever since I was a kiddo. When my Mom came home after work and saw I’d made a pitcher of this tea mash-up, she was so stoked. I poured us each a glass and we sat and sipped it together on the couch while discussing our day. It was so nice to just be together and feel connected with each other over this long-standing tradition of our love for iced tea. We then brought our conversation to the dinner table when my Dad and sister came home which was so awesome because sometimes we get too busy to eat around the table. (Which, okay, is partially my fault because the kitchen table is usually my catch-all for chocolate chips and other sweet ingredients for my cookbook. Sorry Mom). It’s such a cinch to make, too. Simply brew the Lipton Cold Brew Iced Tea into a large pitcher with some water. Let it set and steep and get all golden and marvelous. Once it’s steeped, pour in some pomegranate and orange juices to really give it that zip. 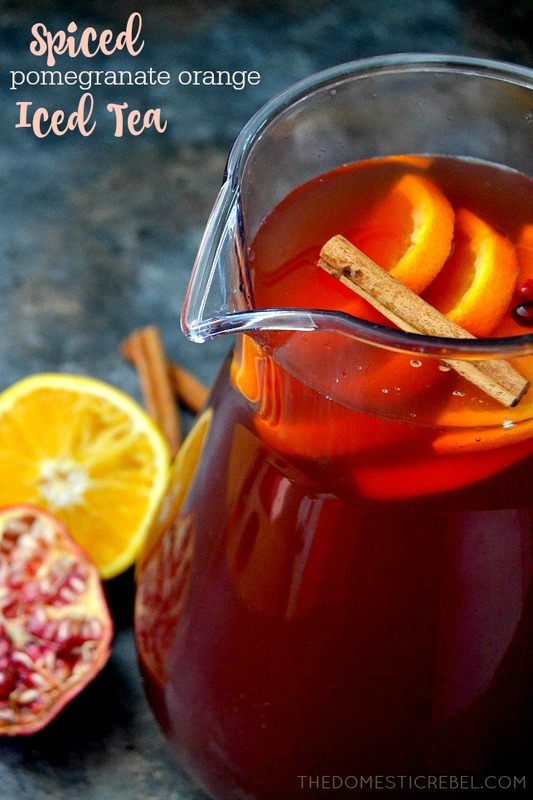 Lastly, drop in some orange slices, pomegranate arils and cinnamon sticks, which give this iced tea a spicy twist. Easy-peasy and oh so good. This recipe also goes with pretty much whatever you’re serving. It’d be fabulous at brunch time with omelettes or French toast; it would be fantastic with a turkey and cranberry Panini for lunch, as the cranberry would mimic the tartness of the pomegranate; and for dinner, we served it alongside spicy sausage pasta. 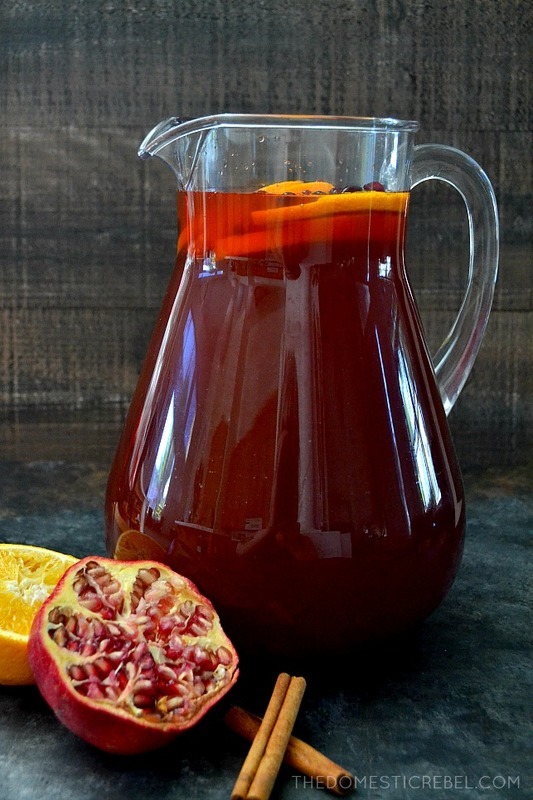 This Spiced Pomegranate Orange Iced Tea is FANTASTIC! Super easy to prepare and has comforting fall-inspired flavors that offer a vibrant, reimagined flavor of iced tea! 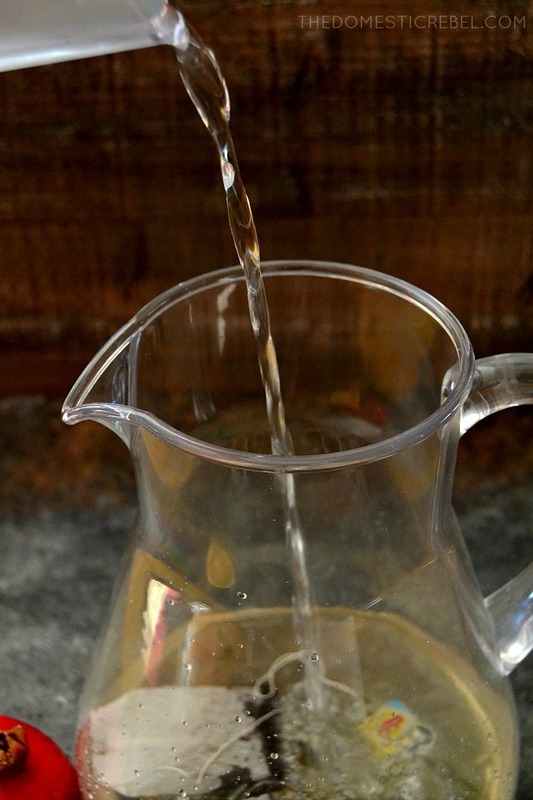 In a large pitcher, pour 8 cups of cold water over the 2 Lipton Cold Brew Tea bags. Cold brew the tea for 5 minutes, dunking the tea bags frequently and stirring occasionally. Remove the tea bags. 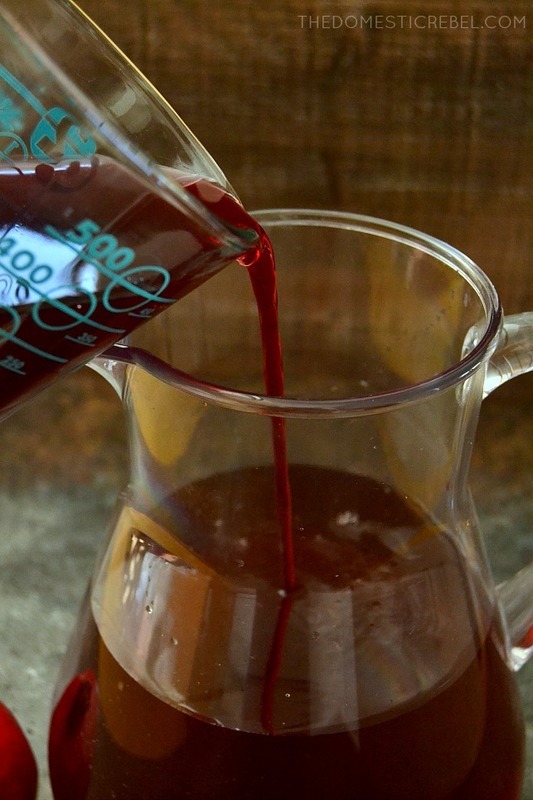 Pour in the pomegranate juice and orange juice, stir to combine. Add in the orange slices, pomegranate arils and cinnamon sticks; stir again to combine. Let set in the fridge for at least 1 hour to allow flavors to meld. Be sure to visit Food Network for more #BrightBites ideas using Lipton Iced Tea!